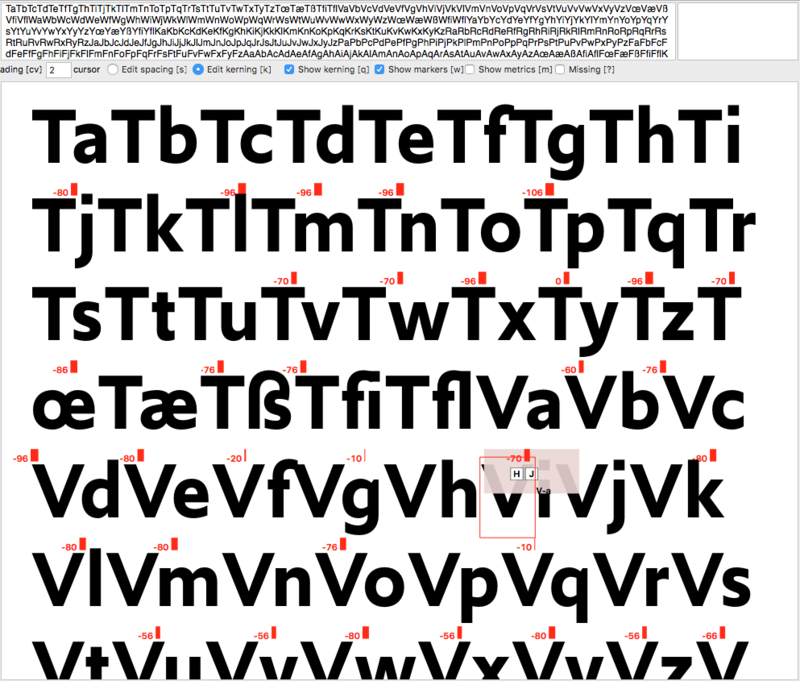 TYPETR Upgrade was made with RoboFont, the type-design tool developed by Frederik Berlaen. The application is entirely written in Python, which allows designers to “hack in” at any level of their tools. RoboFont runs on top of a number of other code libraries, such as Tal Leming’s Vanilla and Defcon, Just van Rossum’s FontTools (now fully supported and maintained by Google), Adobe’s FDK, and Erik van Blokland’s “MutatorMath”, to name a few. The community of professional type designers is relatively small, and its tasks are so diverse, that any comparison to applications like PhotoShop and InDesign fails. 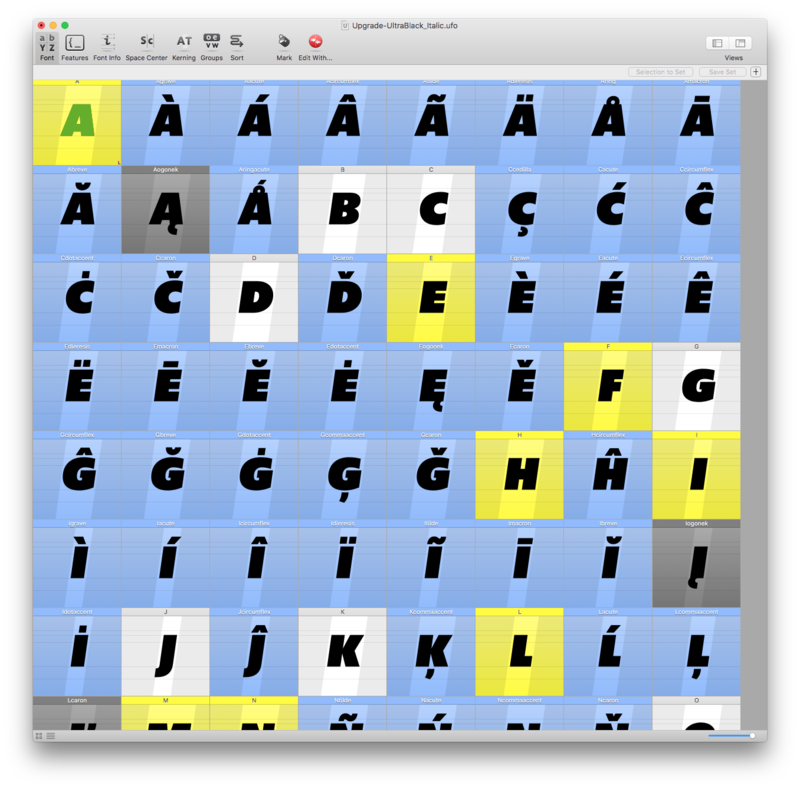 For the most part, type designers need to create their own tools to support the design and production of their typefaces. Any existing, canned solution is likely to be used by graphic designers, too. They don’t need type designers for that. The same applies to the development of TYPETR Upgrade. 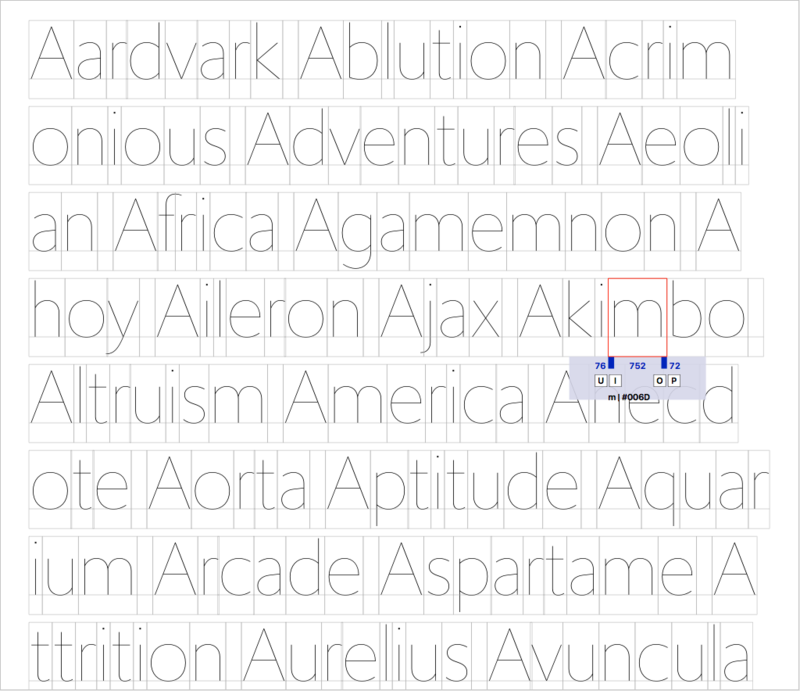 Almost all design and production work was done with Robofont, but over fifty different scripts were used to accomplish specific tasks, such as the automatic creation of characters, testing tension in curvature, testing symmetrical spacing, testing the compatibility of similar shapes, creating proof specimens, automatic kerning where possible, and interpolation and conversion to various output formats. The main reason for developing scripts during the design process is to create short production cycles, so that one can easily test the final result at any stage. Otherwise, wrong guesses can eat up a lot of valuable time. 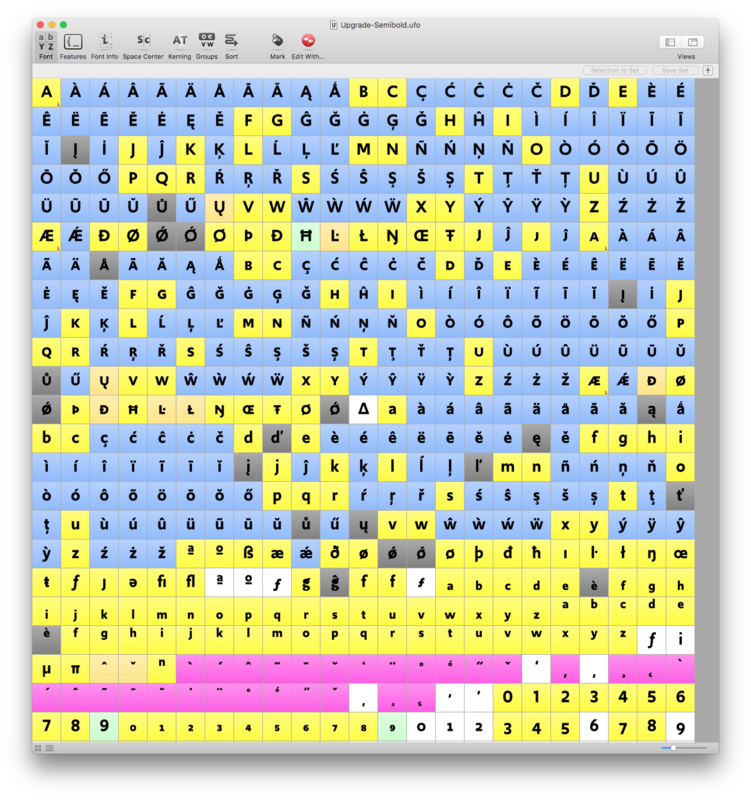 The FontWindow in RoboFont gives an overview of the complete glyph set. Shown here: Upgrade Semibold. Zooming the FontWindow reveals more details about the layering and spacing of glyphs, still as an overview. Shown here: Upgrade UltraBlack Italic. The main EditWindow in RoboFont looks like this. A single letter (Semibold glyph) is shown as an outline, with markers on the position of the points drawn by the designer. Also visible in this window is the addition of a set of Type Network tools that draw the blue accent cloud, the analyzed metrics of the drawing, and some other weights (Hairline and Light) in the background for comparison. 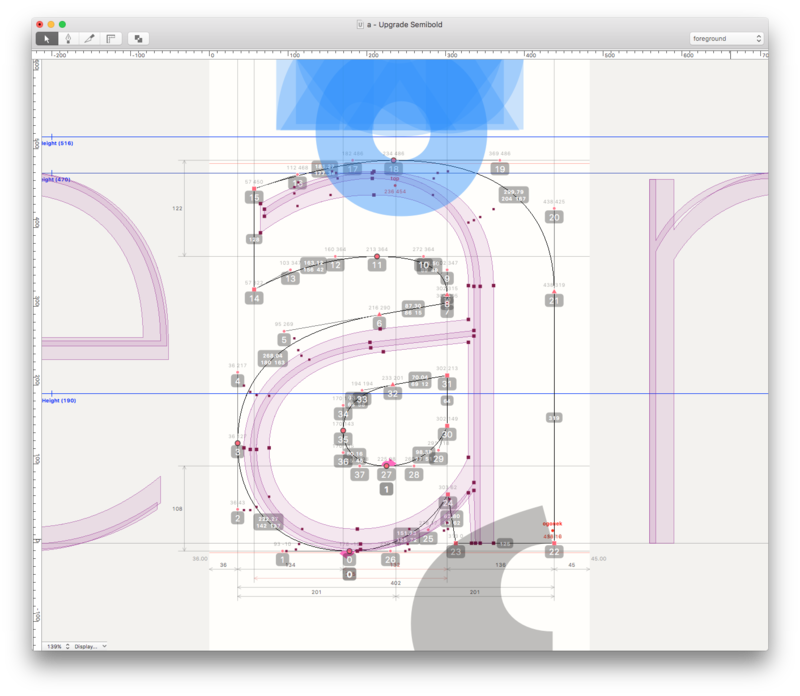 The Type Network application TextCenter—running within RoboFont—is used to finalize the side bearings of all glyphs, while they can be viewed in the context of a page. Upgrade Hairline’s spacing is shown here. Subsequently, kerning is applied. The most important glyph pairs (or groups of glyphs that have a similar shape on the side) can have their own correction value in addition to the spacing. Kerning values can be positive and negative. Here, the spacing process is shown for the Upgrade Semibold style; some pairs, such as To, always need negative kerning. The o moves partly under the roof of the T.